BEWARE! of purchasing a sewing machine online from a store that is beyond driving distance. What will you do if you have a problem that can’t be handled on the phone? You will need to box it up and ship it off to wherever you purchased the machine. Your warranty is through the dealer you purchased from. It is in your best interest to purchase from a brick and mortar Authorized Dealer that does their own repairs in-house and extends the labor part of the warranty to at least 5 years. The Elna trademark has always symbolized quality, innovation and service. Today, Elna continues to build the company with these three elements as the foundation. Elna is a growing company committed to bringing excellence to our customers and our international distribution network. Elna is active in more than 60 countries throughout the world. Unlike Singer, Pfaff, Viking/Husqvarna, Juki, Brother, Babylock, Shark, White and others, Elna does NOT make poor quality disposable machines in CHINA. Don’t purchase poor quality throw-away sewing machines from fabric stores, department stores or internet dealers. The dealer you buy from is the dealer who handles your questions, warranty issues etc… Choose carefully who you buy from. Who you purchase from is more important than what you purchase! Come in and ask us about our FREE extended warranty and 5 Years Free Service with the purchase of your new Elna sewing machine. You also get unlimited “White Glove Service” which means you get first priority, discounts and freebies. 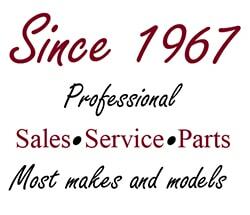 Unlike big stores that do not repair the machines they sell, we service everything we sell! When you purchase a machine from us you are being helped by the service technician, not just a salesman. We want you happy with your new quality ELNA machine and will go the extra mile for YOU because YOU are important to us! Don’t overpay because of a fancy store with high overhead or expensive marketing. We have been here for decades and have very low overhead which allows us to sell for much less than our competition. Don’t pay too much elsewhere and get no service or poor service; purchase in our store and experience “White Glove Service”. Stop by for a demonstration and let us show you why Elna is the best value for your money on the market today. Really! We are a full line dealer and sell every model Elna makes for up to 60% off retail! Below are just some of the models we sell.